In 1867, with the passage of the British North America Act, Canadians began the process of nation building. Over the next few years, new provinces emerged — Manitoba, British Columbia, Prince Edward Island — and Canada became, by 1873, a nation from sea to sea. At the same time, by way of three legal instruments, the federal government was equipped to function as an imperial power. Section 91:24 of the B.N.A Act assigned to it the responsibility for all “Indians and lands reserved for Indians” — a responsibility that had been carried by the Imperial government for the previous century. The Rupert’s Land Order in Council transferred the vast Hudson’s Bay territories to Canada’s exclusive jurisdiction. And finally, in the Indian Act of 1869, the government set out its own vision of future Canada-First Nations relations: an aggressive colonizing project of assimilation not only of First Nations in those territories but of all First Nations throughout the nation. Milloy, John. 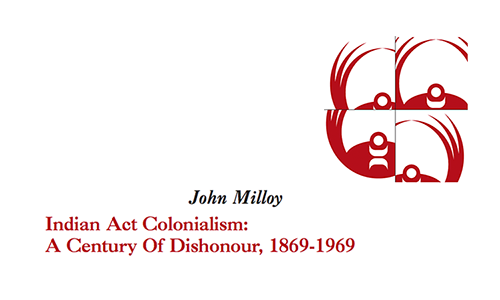 "Indian Act Colonialism: A Century Of Dishonour, 1869-1969". Research Paper for the National Centre for First Nations Governance. The National Centre for First Nations Governance. Canada. May 2008. Paper.